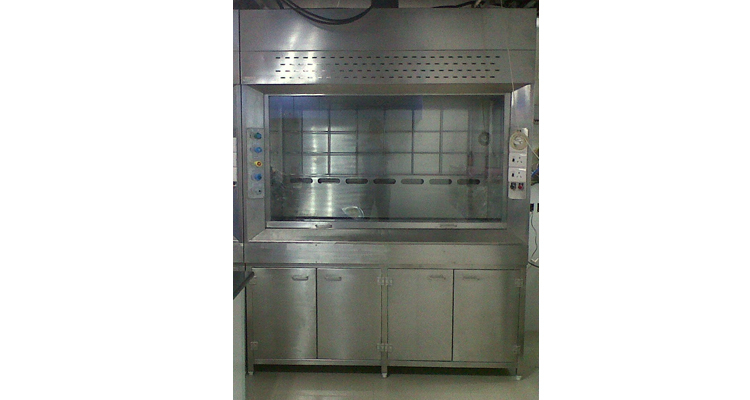 This fume hood is specially designed to withstand a highly acidic and oxidative environment. Perchloric Acid Fume hood and their exhaust system are designed to allow safe use of this chemical. All the exposed parts of the interior is seamless welded coved cornered and made up of 316 stainless steel. The work surface is the integral welded part of the superstructure.it shell be water tight and furnished with a raised edge to contain spills and wash down water . A full width drain through is located below the baffel. An Exhaust collar that extends 12 mm inside the hood chamber and is seem welded to the inside top surface of the chember. Ducting for this fume hood do not integrate in to a room exhaust sysytem also the duct will be of shorter length.Drain outlet is designed to handle minimum of 56 Litres per minute. Our designed is based on Industy Demands , the Highest Quality Material and Latest Technology.We can also make Fumehoods as per your suitable requirements. High quality toughen glass sash. High load carring worktop surface.